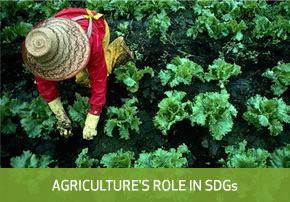 The agricultural sector is well-placed to contribute to the Sustainable Development Goals (SDGs, also known as the “post-2015 “ development agenda, given the sector’s potential to contribute to increased food security, poverty alleviation and reduced child mortality through better nutrition, among others. The SDGs emphasize the importance of agriculture and the need to reinvigorate farming worldwide by supporting farmers, increasing investments in research, technology and market infrastructure and extending knowledge sharing. This will catalyse innovation and empower farmers. Throughout the SDG process, Farming First is bringing the collective voice of farmers, scientists and businesses working in agriculture to the forefront of the dialogue. 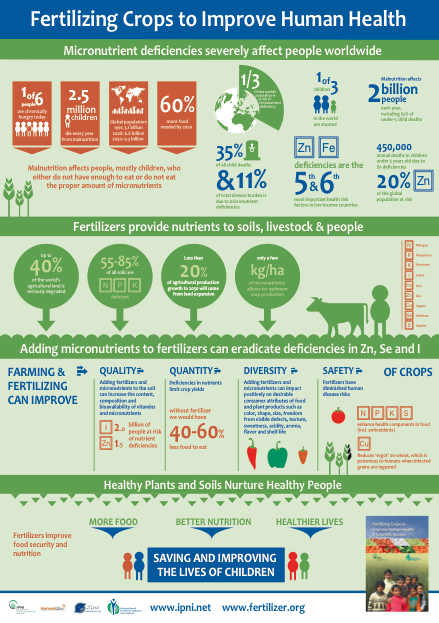 Why is agriculture so important to the Sustainable Development Goals? Investments in agriculture have no parallels in other sectors in terms of the potential to promote food security, nutrition, human development and sustainable economic growth. Farmers in the developing world can become as productive as those in the developed world —while supporting continuous gains in sustainability for all. Farmers need to be empowered through greater knowledge sharing and through delivering accessible, quality extension in farm management and marketing. Agriculture requires supportive frameworks for investment in infrastructure and inclusive markets. If given the right support, farmers and other stakeholders across the value chain have great potential to address food waste and food loss. Share your stories online using #Ag4SDGs! View the sources for the SDG2 quizzes & infographic here. Achim Dobermann is the Deputy Director General for Research at the International Rice Research Institute (IRRI) and Co-Chair of the Thematic Group on Sustainable Agriculture and Food Systems, Sustainable Development Solutions Network (SDSN). In this post, he explores the role of agribusinesses in the new Sustainable Development Agenda and recommends a set of concrete steps on where to start. On 25 September 2013 the United Nations (UN) General Assembly held a special session to advance the global development agenda beyond the current Millenium Development Goals. The new global vision and framework will integrate economic growth, social inclusion, environmental stewardship and good governance as key dimensions of sustainable development, which should become guiding principles for rich and poor countries alike. Led by the Open Working Group of the UN, a set of new Sustainable Development Goals (SDGs) and Targets for the 2016 to 2030 period will likely be agreed on within the next two years. The new goals will aim to motivate transformative changes in both developed and developing countries, but with different starting points, targets and pathways for change. Agriculture will play a central role in the new sustainable development agenda because of its impacts on goals related to poverty, hunger, nutrition, health, economic and social development, education, climate, water and biodiversity. A new global partnership will be required to achieve a deep transformation of agriculture and food systems in developing and developed countries, with businesses having to play a major role. Those working in the agriculture and food sectors, including the science and business communities, should embrace the ongoing process and actively participate in shaping the new SDG agenda. Our generation has a unique opportunity, namely to eradicate extreme poverty and hunger by 2030. But we also face a grand new challenge in the form of rapidly increasing consumption of materials goods, including food and other agricultural products, and resources such as energy, land, water and nutrients needed to produce and process them. Economic growth and the accumulation of more wealth is inevitable if we want people to progress in their lives, but we need to achieve all that in a resource-efficient and sustainable manner. Personally, I’m optimistic because agriculture – despite its challenges – has had an excellent track record of feeding the world through improving productivity. We still have substantial productivity and efficiency gaps to close and we still have many untapped science and technology opportunities, but we need long-term vision and strategy, smart policies, and larger, sustained investments. The SDSN has recently released a report on Solutions for Sustainable Agriculture and Food Systems in which we discuss the challenge domains for agriculture, directions for transforming agriculture and food systems, the contributions of agriculture to the post-2015 sustainable development agenda, solutions for action, and key considerations for planning and implementing action. Although opinions may differ about how to do it, a consensus is emerging that addressing the new challenges requires Sustainable Agricultural Intensification (SAI) in both small and large farms throughout the world. A simple operational definition of Sustainable Agricultural Intensification is to provide sufficient, accessible, nutritious food, while enabling better profitability of farming, economic and social development in rural areas and treating people, animals and the environment with respect. The underlying principles for SAI are well known, and so are many of the concrete short- and long-term solutions. It will require simultaneous interventions along the whole food chain, from production to consumption, including behavior change by consumers as well as producers of food. Not all of the intended results can be achieved at once or simultaneously everywhere. Trade-offs are often required, but we need to start moving in the right direction. There can be no one-size-fits-all solution; there is no single, revolutionary alternative. Ideological battles over whether it is right or wrong to eat meat or whether agriculture should be “conventional”, “GM” or “organic” will not help us with moving forward, particularly when local contexts are ignored in sweeping campaign rhetoric. Countries should follow the most suitable pathways and timelines for addressing their specific challenges through tailored SAI solutions that meet their needs. The role of science, technology and agribusinesses is to provide sound technology choices for each and every farming environment and market segment. This generally requires making farming more precise by implementing genetic, agro-ecological, as well as socioeconomic intensification measures, as well as having the necessary support systems in place for maximum impact. 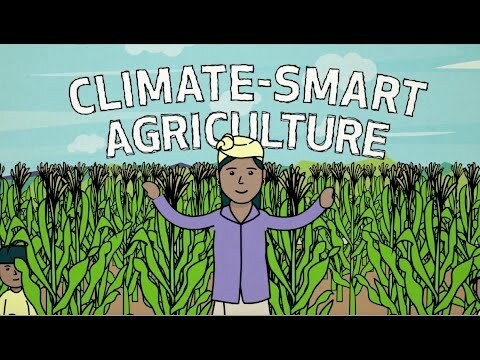 It will require state of the art knowledge and technologies, new business models for smallholder farming, better support services and policies that enhance private sector investment but also put clear constraints on unsustainable or inequitable exploitation of land, water, forests and fisheries. We need to make agriculture an attractive profession for young people to pursue, and we need to make rural towns and villages decent places to live. What specific roles can agribusinesses play in leading or supporting transformational changes in agriculture? I would like to offer two suggestions, and perhaps also challenge the industry to step up its efforts. First, I suggest that that business models in the crop production industry will need to shift towards developing and selling value-added, smart products and services. Leaders in this effort will rely less on selling more raw materials and consuming natural resources and more on selling know-how for a more precise agriculture. This will require new thinking about integrated business solutions that are tailored to local needs in terms of not only providing high-quality inputs at the right time and at affordable cost, but also packaged with a lot more knowledge and information for making the most profitable, most efficient and most sustainable use of such inputs. People and modern information technology need to be at the center of action. Without skilled, knowledgeable, motivated agricultural professionals – farmers, local entrepreneurs, extension workers, scientists, policy makers, and business executives – transformative changes cannot happen. Second, I believe that the industry could also play a significant role in monitoring the performance of agriculture and food systems. The currently available information – even on basic data such as crop production statistics, use and efficiency of inputs, food losses and waste, or soil quality – is scarce or of poor quality in many countries. If we want to succeed with implementing SAI, we will need a whole new level of gathering data to guide targeting of policies and technologies. We also need better metrics to track the performance of agriculture, its enabling systems and services, and its impact on the environment. We will need better intelligence and evidence for moving in the right direction. Companies should embrace the new SDGs, Targets and Indicators (once they are known) and make them an integral part of their business strategy. The industry should engage in developing sound policy and technology roadmaps that help us meet realistic targets for food and nutrition security, agricultural productivity, resource efficiency, rural development, and the environment. We will need structured “backcasting” methodologies for that, for which the industry could provide much own expertise and support. 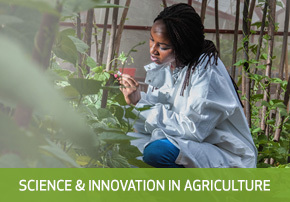 The industry should contribute more to research on future systems solutions, including research on groundbreaking new technologies, smart products and knowledge services, digital tools for agriculture, new education and training programs that also make use of modern ICT, new monitoring schemes for agriculture, and public-private R&D collaboration. We need to have a long-term strategy for making transformative changes, and that requires wider R&D efforts and participation by small, medium and large companies, beyond their own R&D efforts. Perhaps we also need new funding models for that, such as creating an industry-led trust fund to support R&D and capacity building initiatives with public and private sector participation. Agribusinesses should support and participate in initiatives with concrete solutions that can be delivered at scale, including, for example, initiatives on new business models for smallholder farming, initiatives that aim to greatly improve environmental stewardship in conjunction with meeting targets for high productivity, resource efficiency and profitability, or initiatives on improving nutrition and health. I have worked myself for more than 25 years on better approaches for nutrient and crop management in some of the world’s most important cropping systems, in close collaboration with the agricultural industry. 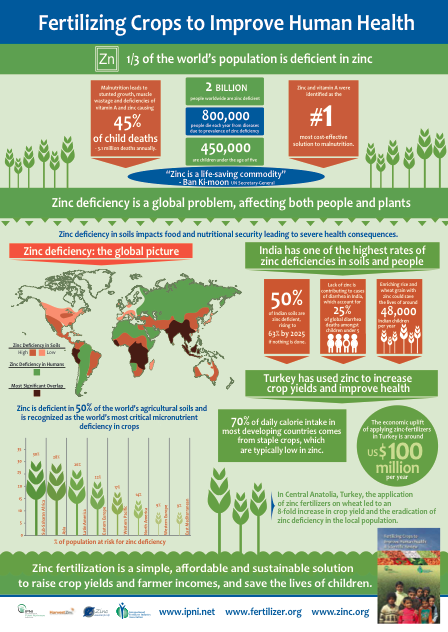 Despite many successes and good developments, I find it personally embarrassing and simply not acceptable how low yields are and how inefficient many production technologies remain on hundreds of millions of farms worldwide. We know that agriculture will have to become much more precise and attractive if we want to achieve the new SDGs. We also know that this is feasible because there are short- and long-term solutions we can pursue. Now is the time to act and move towards transformative changes of agriculture and food systems. As the global community increasingly focuses on the post-2015 development agenda, the recent Report from the High Level Panel on the Post-2015 Development Agenda has underlined the central role that agriculture will play in achieving sustainable development and food and nutrition security. Established by the UN Secretary General in May 2012, the High Level Panel is mandated with providing recommendations on the Sustainable Development Goals (SDGs) to succeed the Millennium Development Goals (MDGs). The publication of its final report, “A New Global Partnership: Eradicate Poverty and Transform Economies through Sustainable Development” on 30th May 2013, sets out “a universal agenda to eradicate extreme poverty from the face of the earth by 2030, and deliver on the promise of sustainable development”. In this blog, we offer an overview of key outcomes of this critical High Level Panel Report and Farming First’s response to it, in line with our recently published position paper. The Report offers a clear outline of what should be expected for the future of sustainable development, outlining a set of 12 goals and 54 measurable targets. These goals and targets build on the framework set-out by the Millennium Development Goals and go beyond health, education and poverty to focus on areas now seen as central to achieving sustainable development: infrastructure, property rights, governance, personal safety, an end to violence and discrimination, and gender equality. • Forging a new Global Partnership that is not just about national governments but also includes businesses, community groups, donors, local governments and others, working together to eradicate extreme poverty. Forging new partnerships is crucial to the effective role of agriculture and achieving sustainable development, with Farming First acting to bring together all stakeholders in the agricultural sector to lay the foundations for future development. 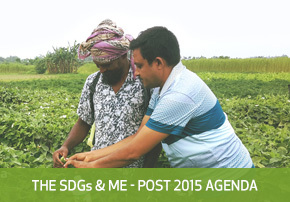 In our key messages for the post-2015 development agenda, Farming First has underlined the importance of agriculture and food and nutrition security as being central to realising the post-2015 agenda and the Sustainable Development Goals. In other words, the sustainable production of enough nutritious food requires investing in agriculture. In May, Farming First outlined its five key messages for the post-2015 development agenda and we are encouraged to see the movement towards recognition of the role of agriculture. Why? Because “We can end hunger, extreme poverty and the worst impacts of malnutrition and food security within a generation” (Madrid Consultation FAO-WFP, 4 April 2013). Why? Because this goal should recognise and support a wide diversity of agricultural systems, farming practices, technologies and farmers, as well as balanced diets. It should also recognise that sustainable agriculture differs by landscapes. Thus, countries and farmers need flexibility and a variety of solutions. • A greater focus is necessary on working with farmers and other actors across the value chain to address not just food waste but food loss. 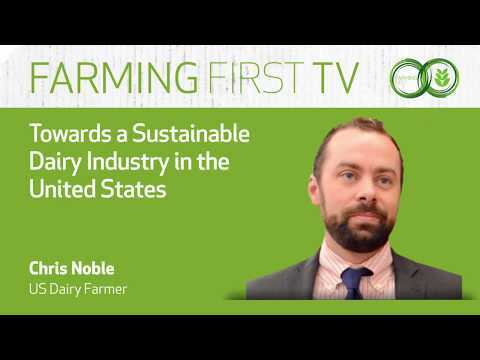 Farming First aims to play an important role in the debates surrounding the post-2015 agenda and SDGs in order to bring together the collective voice of farmers, scientists and businesses working in agriculture. Farmers must be at the heart of solutions provided to achieve sustainable development, with investments in agriculture having no parallels with other sectors in terms of the potential to promote human development and sustainable economic growth. To read our position statement in full, see here.